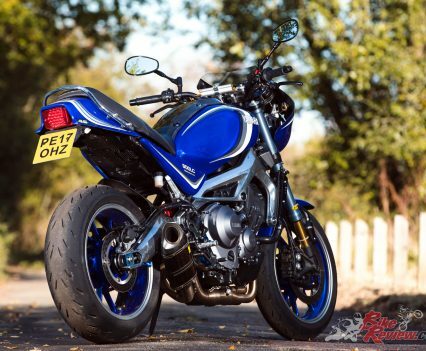 For those who delight in the sheer hedonism of racing around on a 350LC Yamaha but can’t now cope with the weedy handling, here’s the antidote – a Velocity-Moto Yamaha XSR900 based 900LC. Designed by Surrey-based legend Fast Bikes contributor, racer and builder, Hag Hughes, the 900LC captures the look of the popular two-stroke twin, unlike many of the so-called ‘yard builds’ that are popular today. 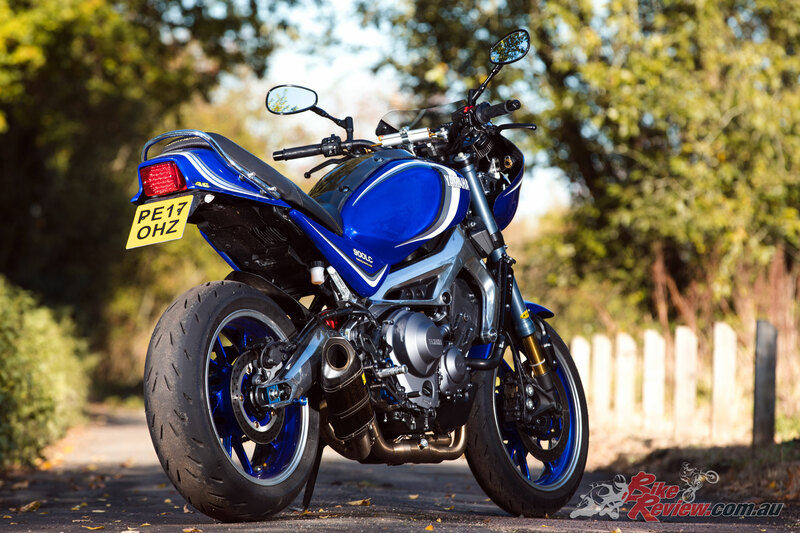 It’s based on the XSR900, Yamaha’s retro-styled version of the three-cylinder MT-09, with a bodywork kit that can either be fitted by the owner or specified when the bike is bought new. And I have to say that the version I tried out, which included extra servings of style and performance bling, was everything that made the Elsie great, and more besides, in a modern package. 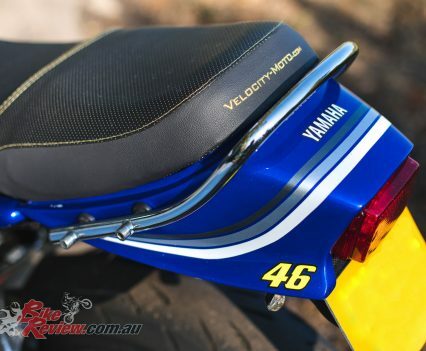 For Hag, who’s been building tasty racers and track-day machines for many years, the project sounds like a labour of love, and combined his current business – called Velocity-Moto.com – of offering trick bike parts with his experience of producing graphics and signage for posters and buildings. 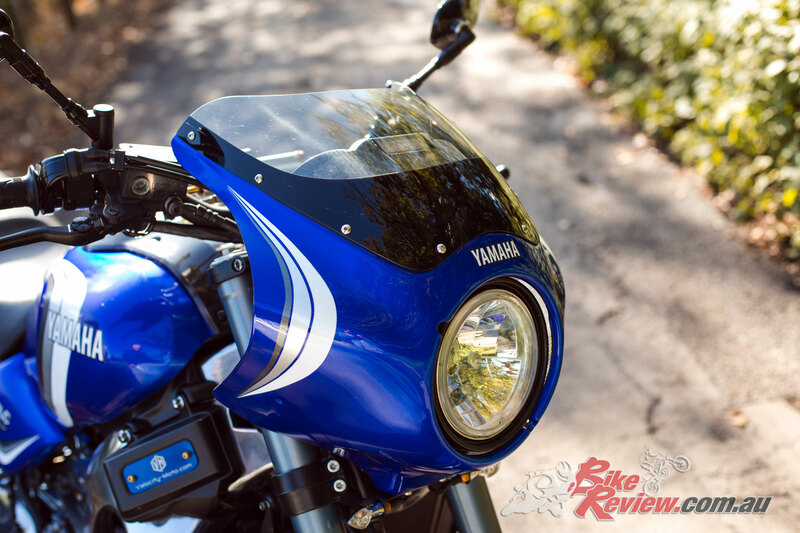 “We raced 350LCs in the ‘80s and were real hooligans,” says Hag, “but these days the bikes have their limitations.” So to regenerate the LC concept in a way that enables riders to relive the dream, he designed a new tail fairing and side panels in GRP for the XSR900 and applied his skills in the design and production of decals that capture the right look. 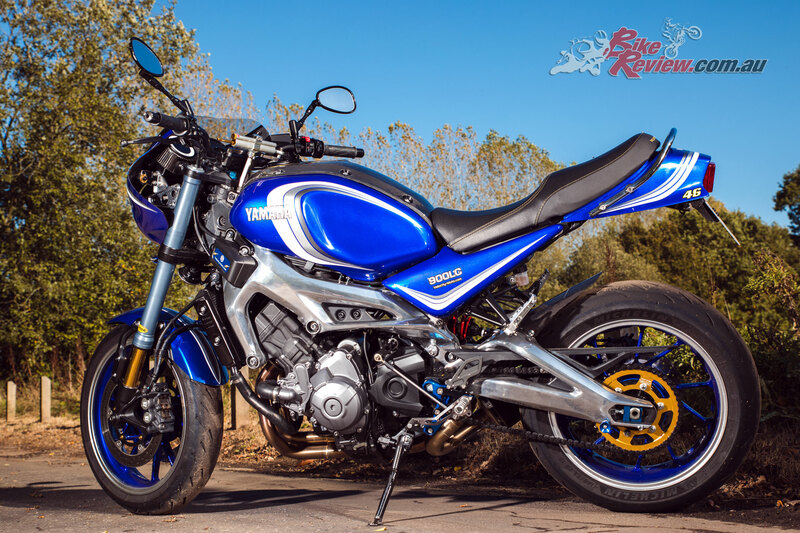 The body kit includes a remodelled seat and rear lamp, a handlebar fairing and a carbon-fibre console that mimics the 350LC’s and accepts the XSR900’s single instrument. To my surprise, the top and side panels that enclose the fuel tank are the original aluminium styling items, but because the decals are so cleverly designed, the larger size still looks like an LC’s tank, which is a design icon in its own right. 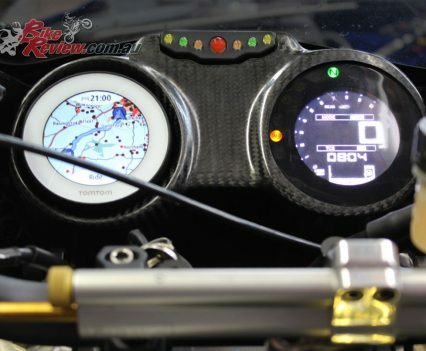 Also included is a Tom Tom satnav that nestles in the left-hand console, and is activated by a smartphone, and the vestigial front indicators. 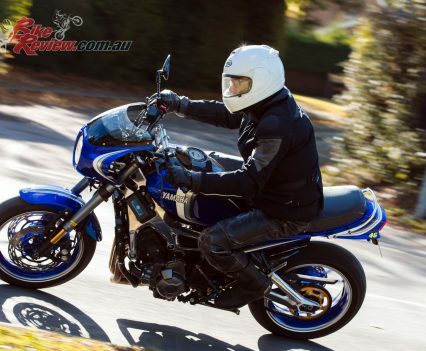 Not having ridden the unmodified XSR900 I can’t pass judgement on its feel, but the 900LC was for me just about as well-balanced as it could be for anything up to banzai motorway blasts. The flat ’bar, cosy seat and footrests matched the cutaways in the tank’s side covers like a well-fitted suit. It captures the look and character of bikes from the late ‘70s and early ‘80s to perfection, with none of the modern trend for the inescapable angular Alien, Mad Max or Transformer faces. 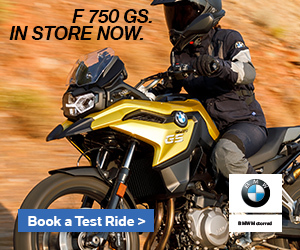 Park the 900LC anywhere and on-lookers are delighted to see what is a traditional motorcycle and then some. 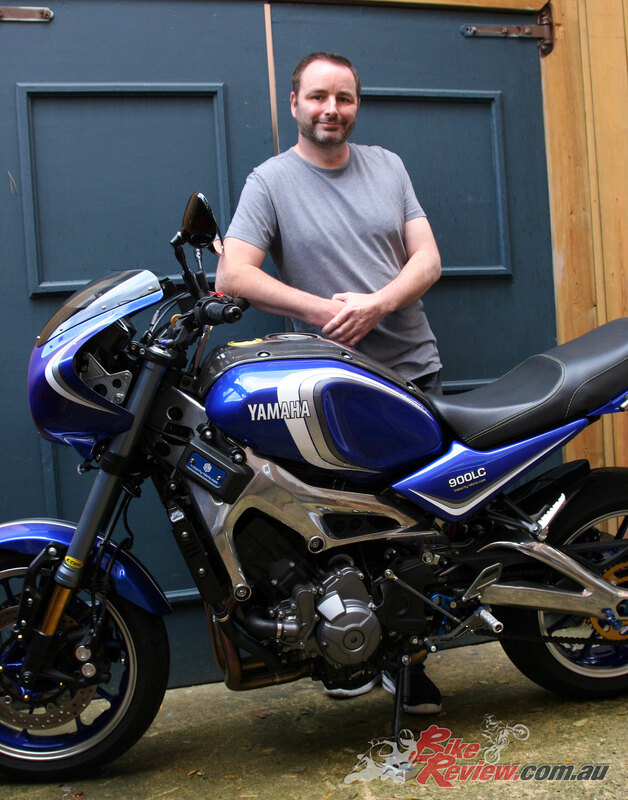 The 900LC is so faithful to the style of the RD350LC that when I took the bike to Yamaha UK’s base in nearby Woking, marketing manager Jeff Turner was gobsmacked. 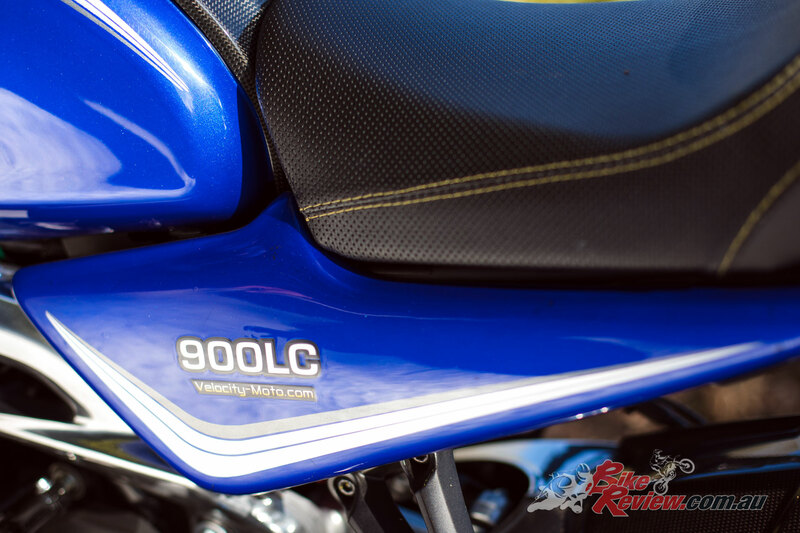 Hag has been arranging for Yamaha dealers to sell the 900LC, enabling finance deals to be offered along with a factory warranty, the first of which was Woking Yamaha. 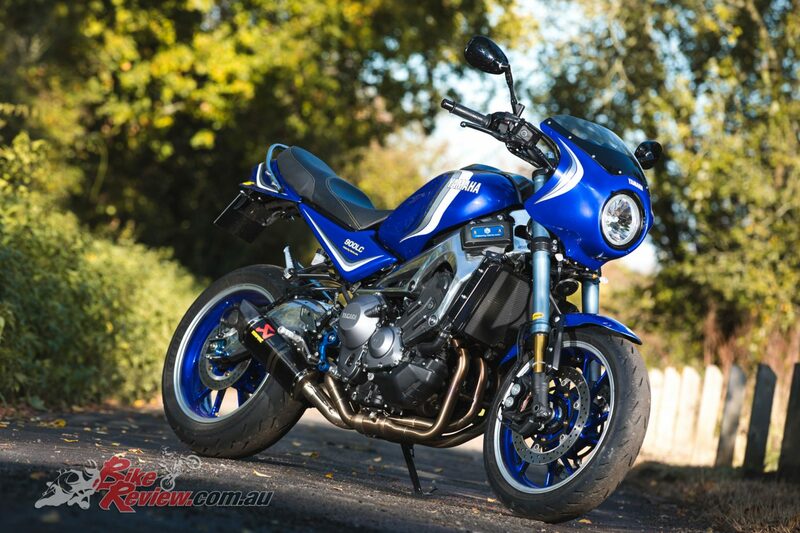 For existing owners of the XSR900, the body kit costs $2795 AUD at time of publishing, with $15600 for the paintwork. 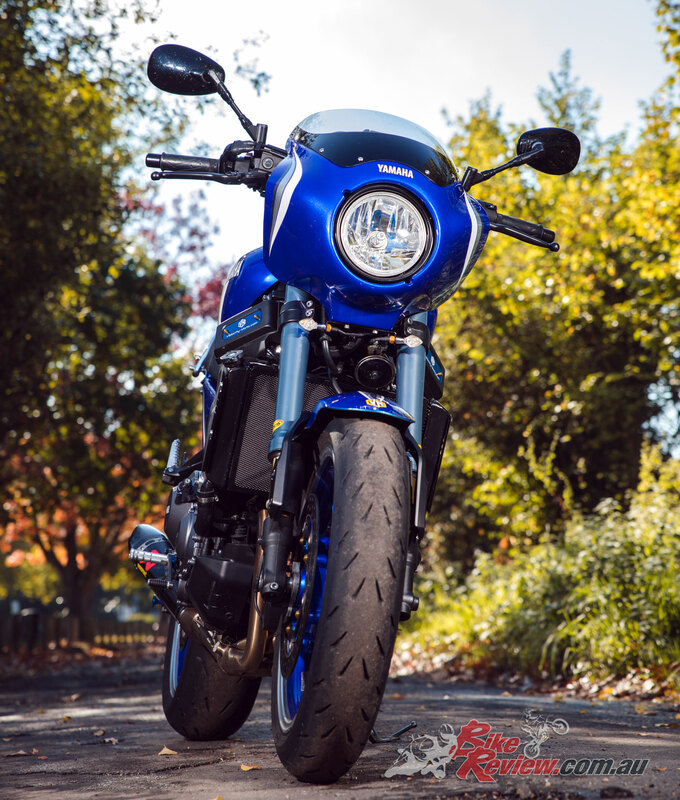 But it should be obvious that the deep blue 900LC pictured is a platform for more than just the body kit, with a range of performance and handling goodies offered by Velocity-Moto.com. 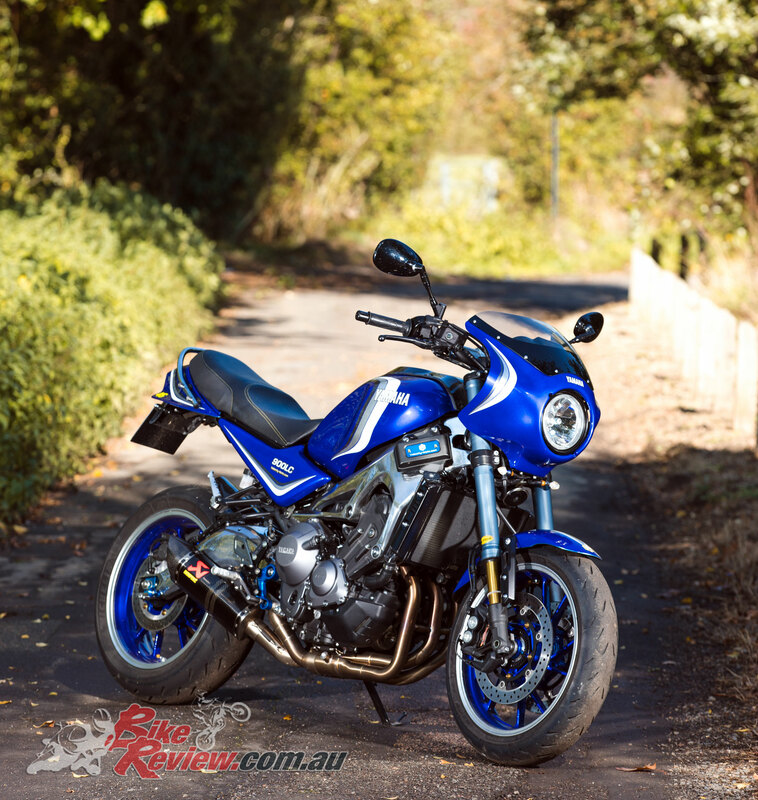 The XSR900 it is based on is a fine machine, featuring a three-cylinder 847cc 12-valve engine that with a 120-degree crank and balance shaft is smooth and refined, check out Pommie’s test on Yamaha Australia’s custom Kenny Roberts XSR here and our XSR review here. 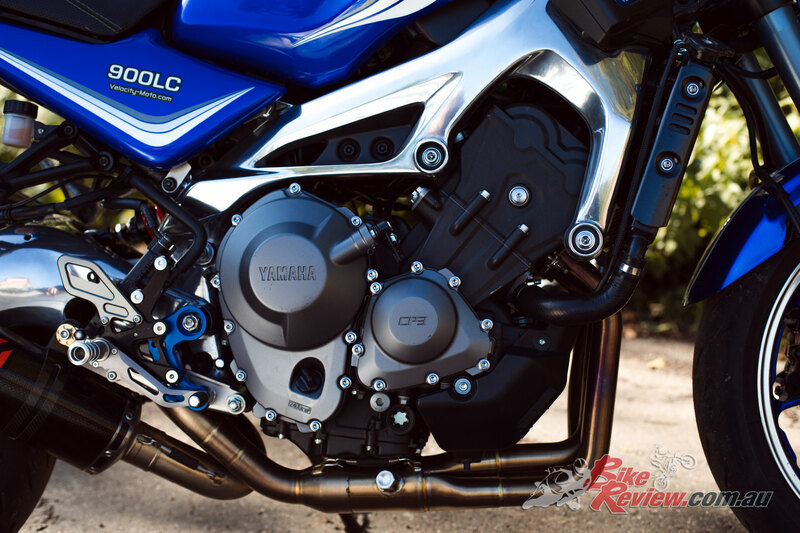 The engine comes with features like intake ports with asymmetric geometry, ride-by-wire throttle control and a choice of riding modes that change the power curve, along with traction control. 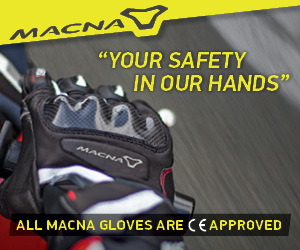 The clutch has slip-and-assist, which is said to help when changing down aggressively through the six-speed box and enables a lighter action at the handlebar lever. 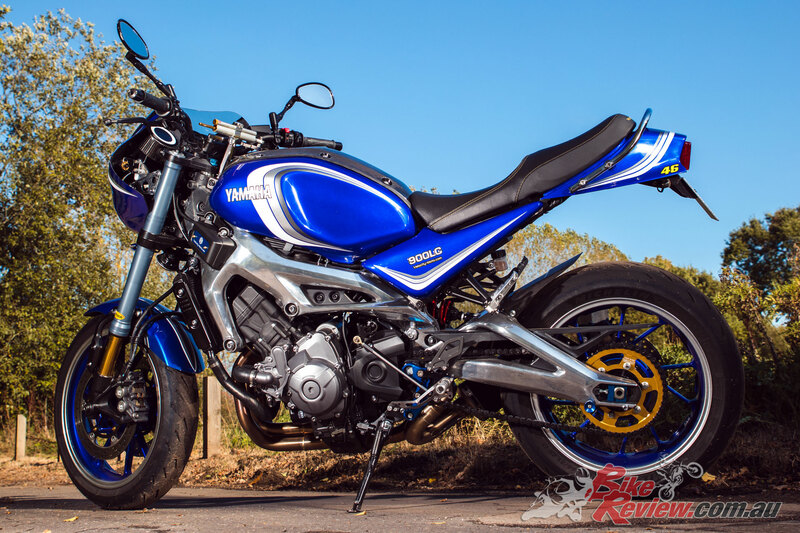 Launched in 2016, the XSR900 has a more highly-specified chassis than the XSR700 twin, and features a die-cast aluminium-alloy frame and rear fork, and an inverted telescopic fork. Wheel sizes are what you’d expect, 17 inch cast-alloys front and rear, with dual front rotors and radial four-piston calipers using ABS. With peak power of 115bhp at 10,000rpm on tap, there’s more than urge enough to keep you busy up to the practical aerodynamic maximum of about 130km/h. 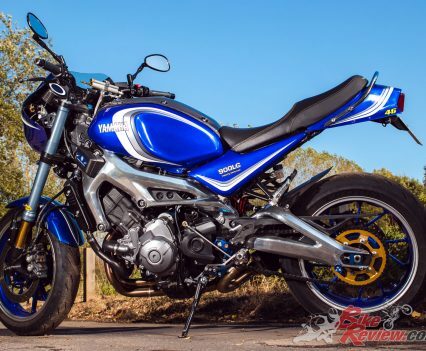 In stock trim, the XSR900 is geared for 240km/h, so at the 110km/h legal limit, the engine’s singing along at a relaxed 4700rpm. 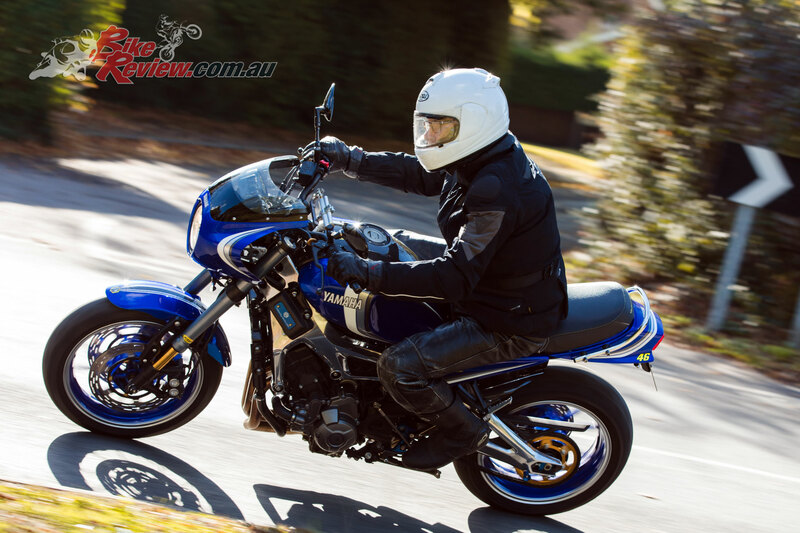 Hag reckons that despite this contemporary specification within the context of retro-styling, there’s much room for improvement to the basic XSR900. 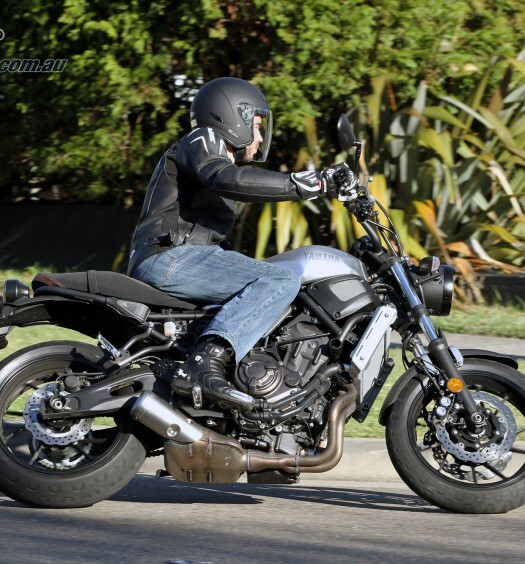 Even though the suspension was modified with revised damping compared with the MT-09, the XSR is still lush and lacks precision, and Euro4 requirements for emissions and noise result in a throttle response that’s dull, particularly at the bottom end of the range. 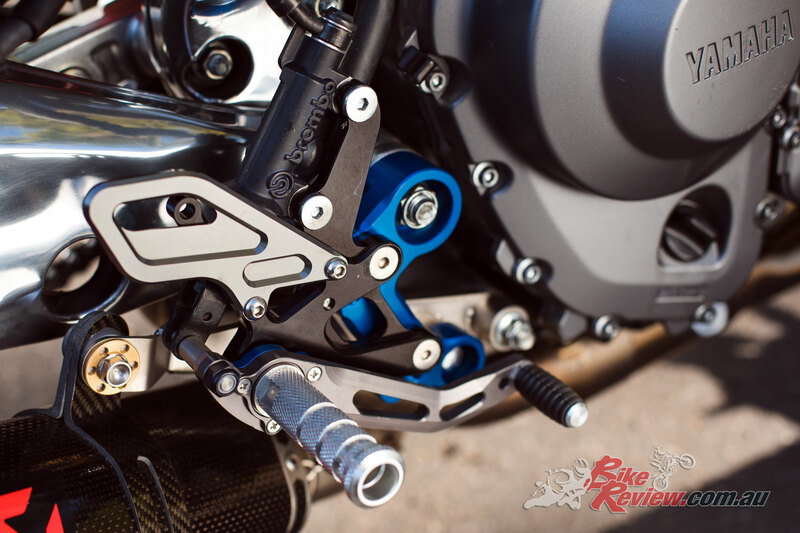 Two options are offered for uprating the suspension, from either K-Tech or Ohlins. 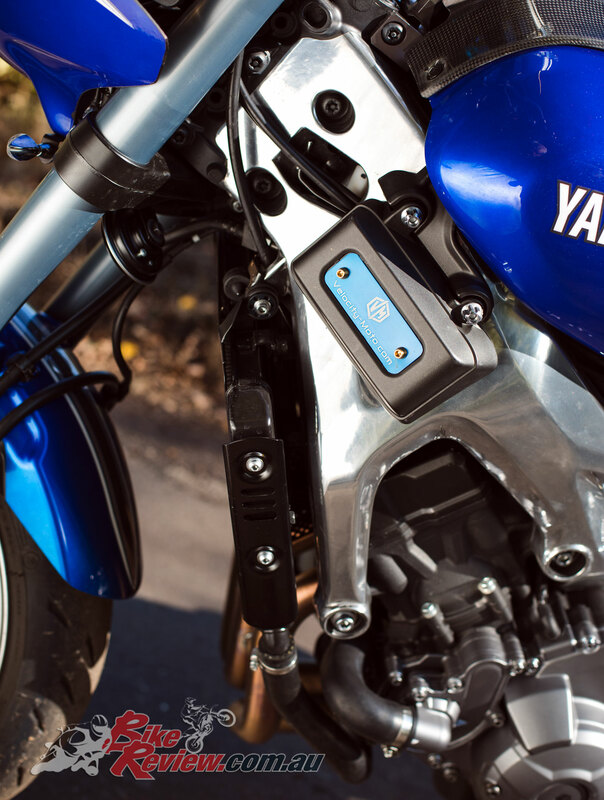 The blue XSR900 shown came with a K-Tech kit, in which the internals of Yamaha’s upside down telescopic fork are replaced with new springs and a cartridge damper set-up featuring adjustability for preload, and damping, both compression and rebound. 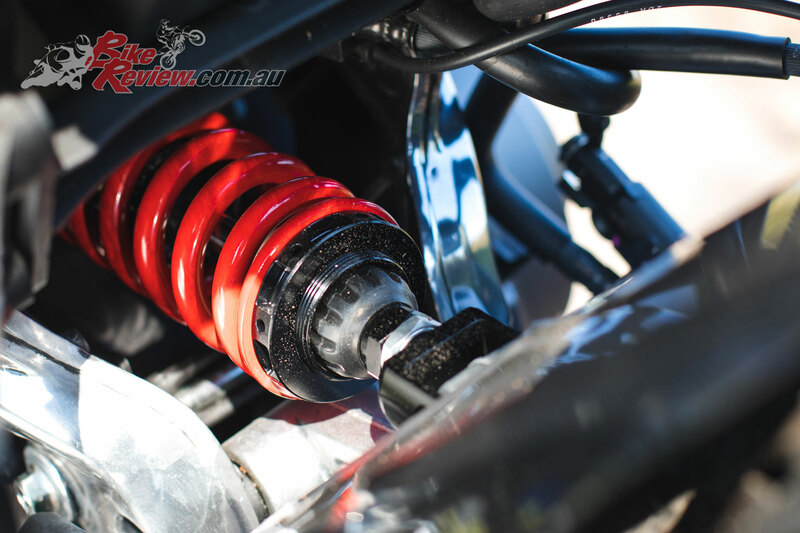 The rear suspension has a rising-rate linkage that’s unchanged but the single shock is replaced by a K-Tech item. On the test bike this was the basic item with preload and rebound-only damping adjustment, but a more sophisticated remote-reservoir version with full damping adjustment is available. The K-Tech-fitted bike has a firmer and well-controlled ride and without altering the geometry the steering is very light and responsive. 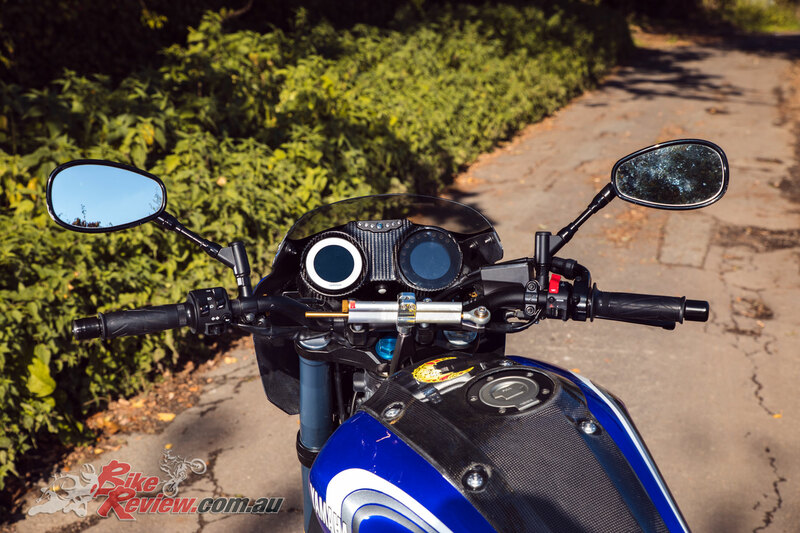 Indeed, there’s an element of a racer in its feel: nudge the flattish handlebar at speed and there’s a hint of an incipient shimmy, so no wonder that there’s also an option of a steering damper. 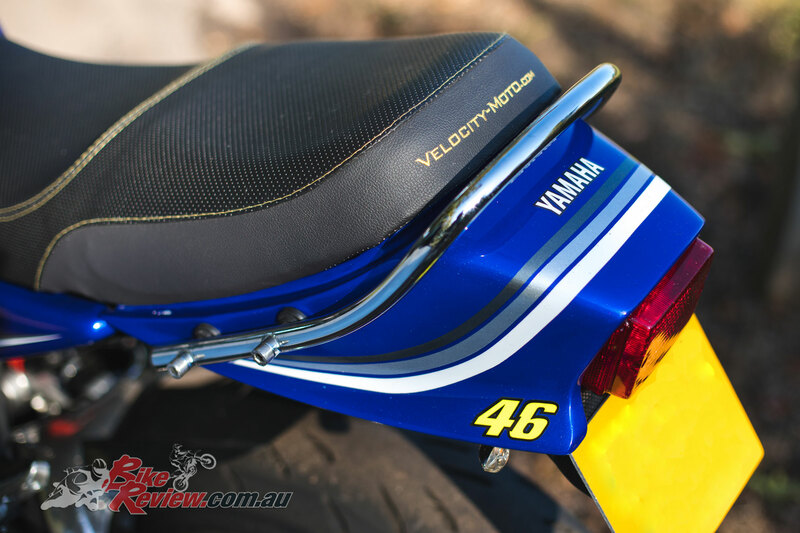 I preferred the damper turned down, simply because I liked the nervousness of the bike. After all, this is just the way a 350LC felt, although that was because the frame was so flimsy. I mentioned the firmness of the suspension to Hag. He says it was set up for his weight, which is about 7kg more than me, so no surprise there. 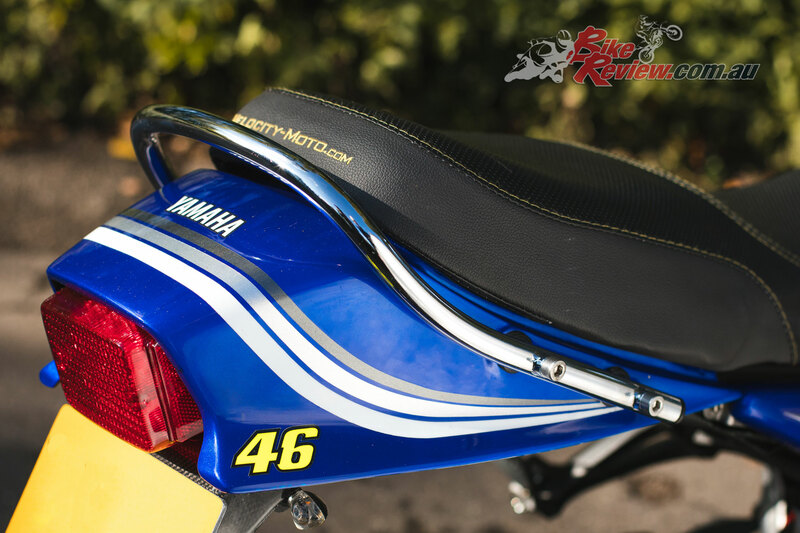 To add a bit of rider weight to the front and exploit the waspish proportions of the frame behind the engine, more stylish footrests were fitted that are about 25mm further back and tad higher. 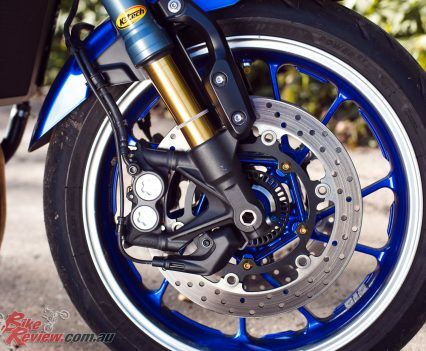 There’s room for this because the swingarm pivots outside of the frame, so you can tuck your feet in easily. 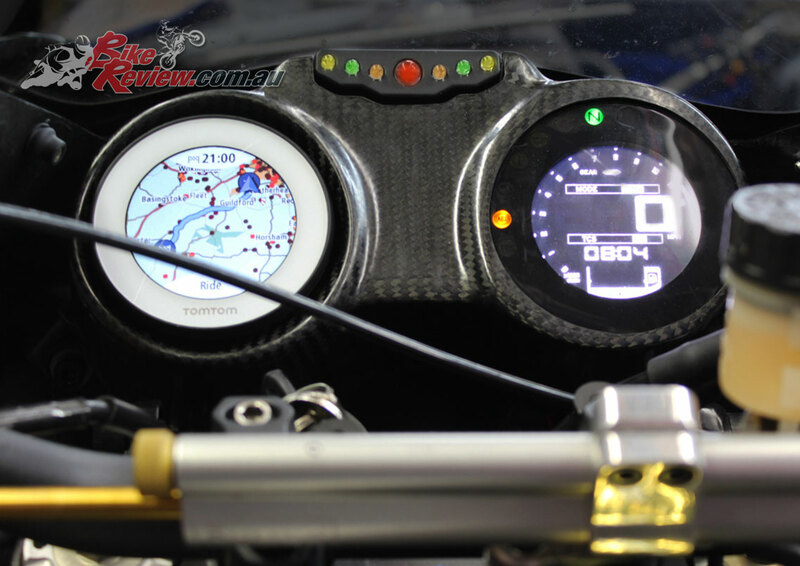 The handlebar and hand controls remain stock but the instrument console inside the bikini fairing mimics the original 350LC clocks well. Above and between them are a set of lights that flash up as the engine red is reached. 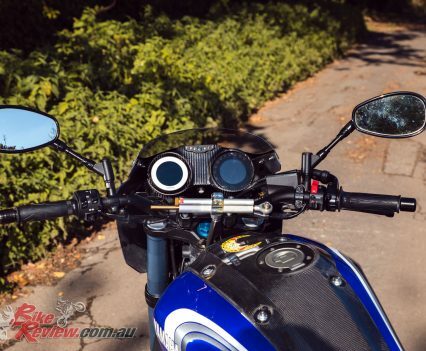 Without having direct experience of the stock bike’s performance, I can’t comment on how much better are Hag’s modifications, which include an Akrapovic three-into-one exhaust system and a reflash of the ECU, which enables previously-tested injection and ignition curves to be installed through a laptop. 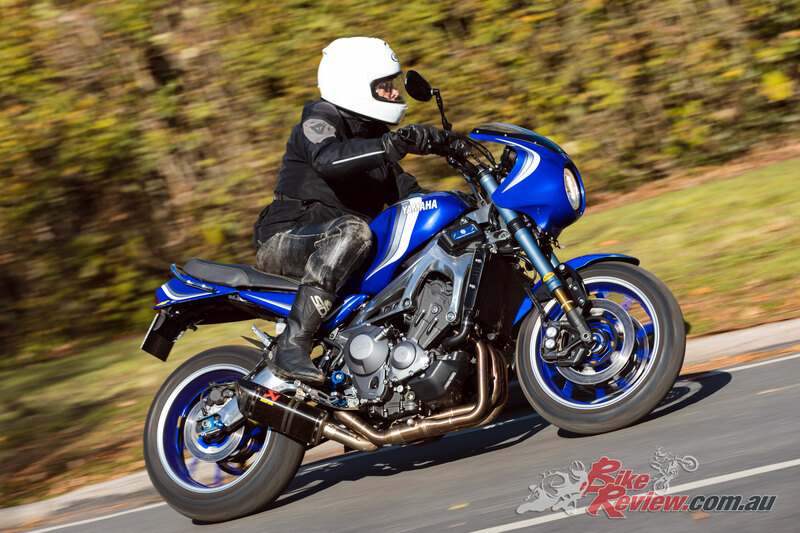 I can say that the exhaust note is, well, fruity with a basal drone that is guaranteed to alert the neighbours in not just early-morning starts, and will please those who reckon that a louder-than-stock motorcycle provides a safety margin in traffic. 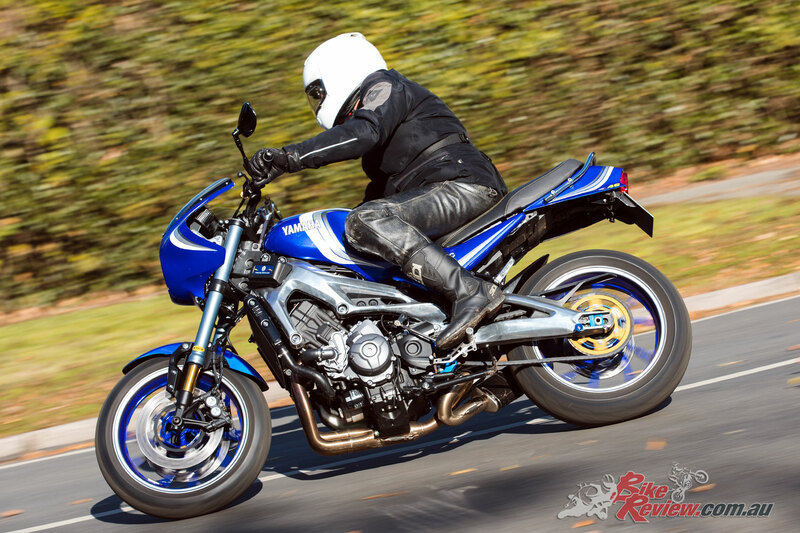 The performance tweak really does give the XSR900 a huge amount of response at lower revs with no uncertainty from a closed twistgrip, so much so that I was happy to pull higher gears most of the time. This isn’t troubling to the transmission because the motor is so smooth anyway. Curious as I was to find out what the top-end performance was like I gave it a go on a clean section of quiet blacktop. It’s easy to be cruising a motorway, and find after a short overtaking squirt that three-figure speeds are no more than a few seconds of acceleration away. On country roads that is magnified by several orders, and the better suspension is a real boon to get you out of potential trouble. 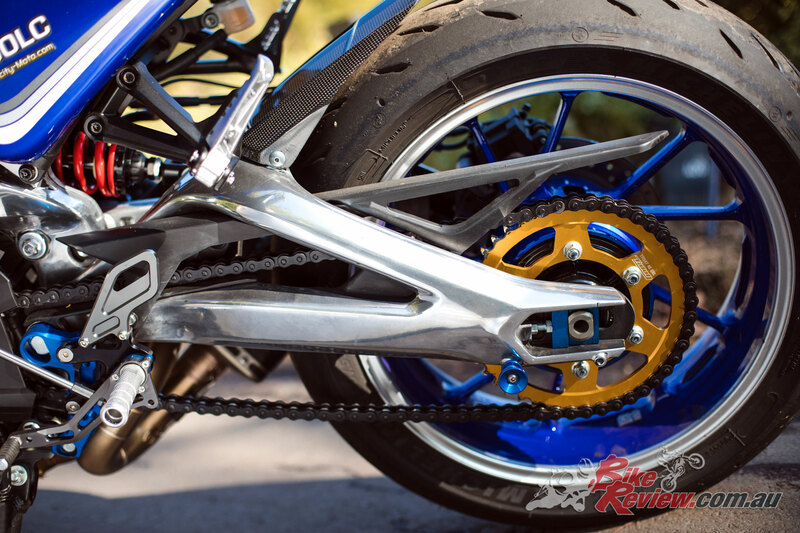 I’d figured that the gearing had been lowered to give better acceleration but inspection of the replacement Talon rear-wheel sprocket showed it have the same 45 teeth as the stock machine. 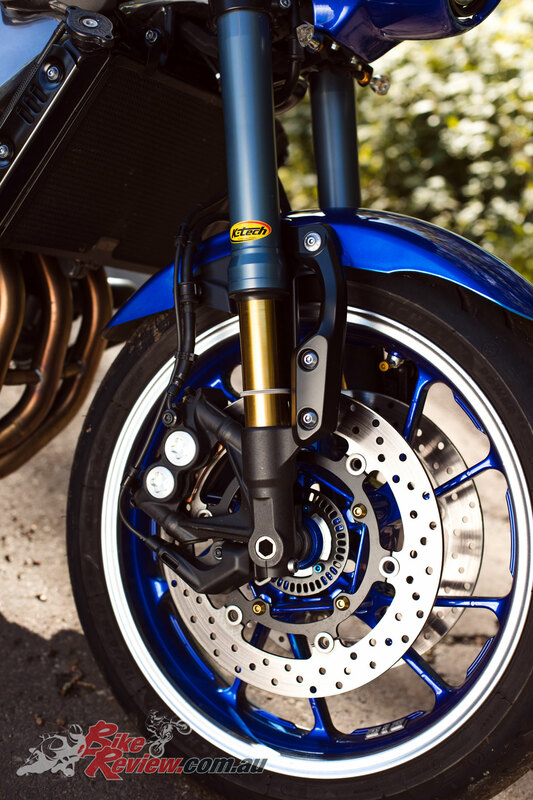 To get a measure of the effectiveness of the reflashed ECU, Hag took the bike to be tested on the dynamometer operated by PDQ in Taplow in Buckinghamshire. 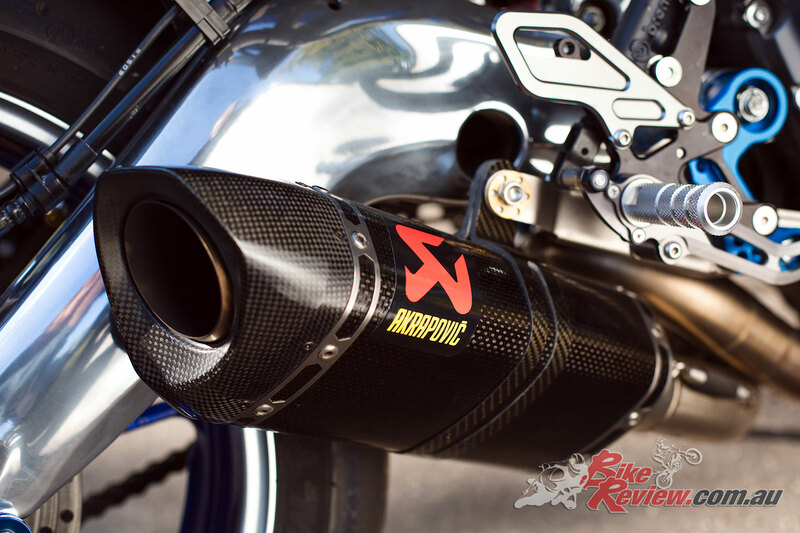 With the stock exhaust system peak power was up to 119hp, he said, with almost 125bhp with the Akrapovic. 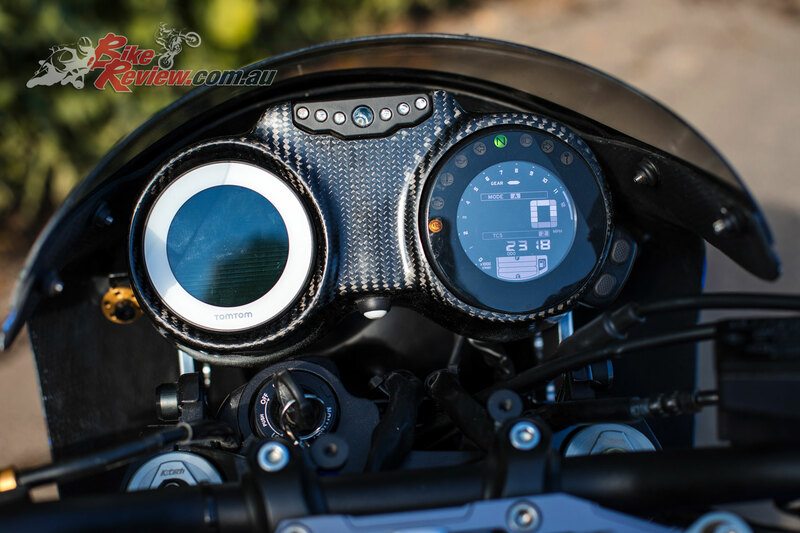 Cosmetically, the authentic design style of the 350LC is best reproduced by the matt black of the XSR900’s frame and fittings. But I had to like the treatment of the light-alloy, which before assembly had been cut back to the metal and polished to within an inch of its life, followed by (I hope) some clear lacquer. Other more subtle items included the matching colours of the wheels and the vestigial turn singles. I was surprised by Hag’s take on the 350LC in a modern reincarnation. I’d seen it first in a newspaper and turned up my nose, but in the flesh, and better still after riding the bike I could see the appeal of styling a modern machine like those we’d enjoyed 30 or 40 years ago. Nothing wrong with that, particularly because the 900LC works so well, and is a practical machine to use, though I’d prefer a less raucous sound. But if you like the idea authentically reliving the hooligan riding days of your misspent youth, the 900LC is capable of serving it up in dollops. Hag spent his youth riding freestyle BMX but when it came to getting a motor in his two-wheeler his folks were dead against it. As his family had a few bob, when Hag saved up for a motocrosser, dad relented and built his own track for Hughes junior in the garden, provided he never rode on the road. 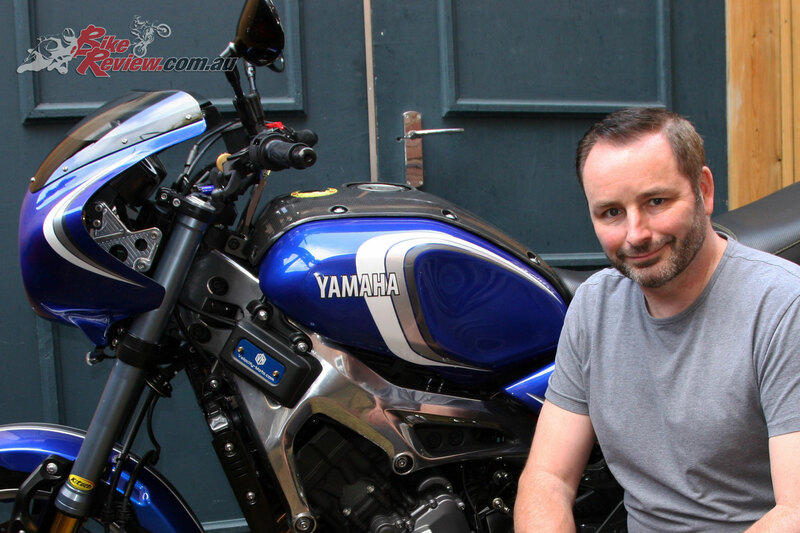 Eventually dad would find out about the bike and after a big family row, Hughes junior would go and live with brothers Jason and Sean Emmett – both were going to have big race careers and become (with Hag) part and parcel of Fast Bikes magazine [I still have every issue – Ed]. Hag – as well as the Emmetts – would race and write for FB, but it was Hag’s specials and amazing paint work that he was known for. 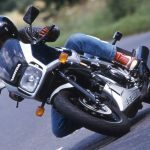 A number of bikes made it into Fast Bikes’ pages and Crossbow calendars, including the legendary Harribox with FZR1000 motor and ‘The B*stard’, which was a mix of RC30 rear end, OW-01 frame, FZR1000 motor and Yamaha/Ohlins front-end. 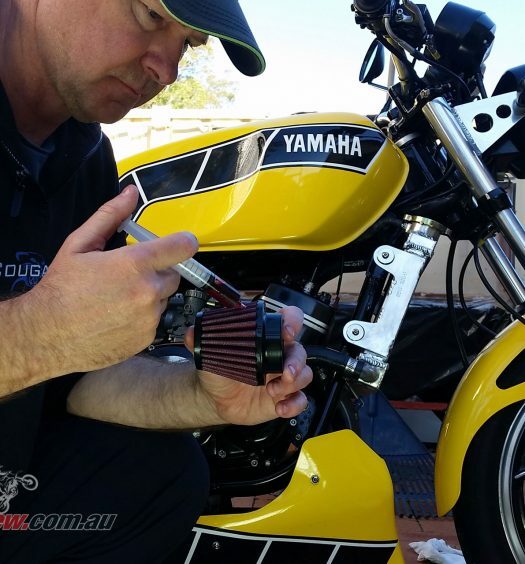 Hag was also one of the first guys to mate the strong ZX-9R motor into the better-handling ZXR750 chassis. Hag has had time as a self-help guru (he trained under Paul McKenna) and an author, but we’re also glad he’s back into the bikes in a big way. Legend! 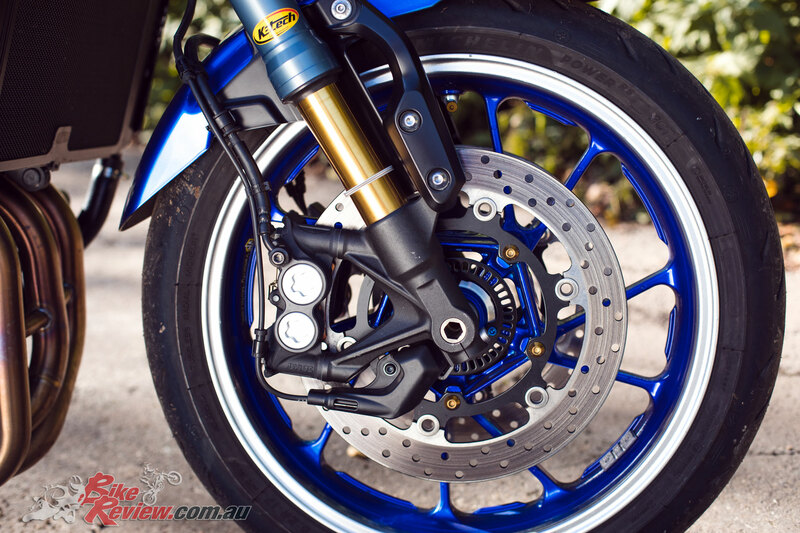 Brakes: Front: Four-piston radial-mount calipers, 298mm stainless steel rotors. ABS. 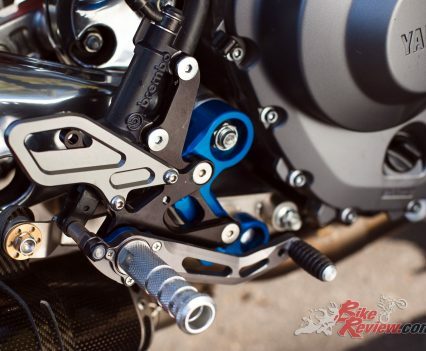 Rear brake: Single-piston slide caliper, 245mm stainless steel rotor. ABS. Wheels & Tyres: Light alloy wheels, 3.50 x 17in & 5.50 x 17in, 120/70 – 17, 180/55 – 17.